To The Remnant: Who's Up for a Family Reunion? And the Lord called his people Zion, because they were of one heart and one mind, and dwelt in righteousness; and there was no poor among them. Such people, united in the mind of God, will have no poor among them because they will be of a mind to care for the poor. And so, to this end, I'm delighted to announce an upcoming opportunity for like-minded individuals and groups to come together in faith, worship, and communion with God. 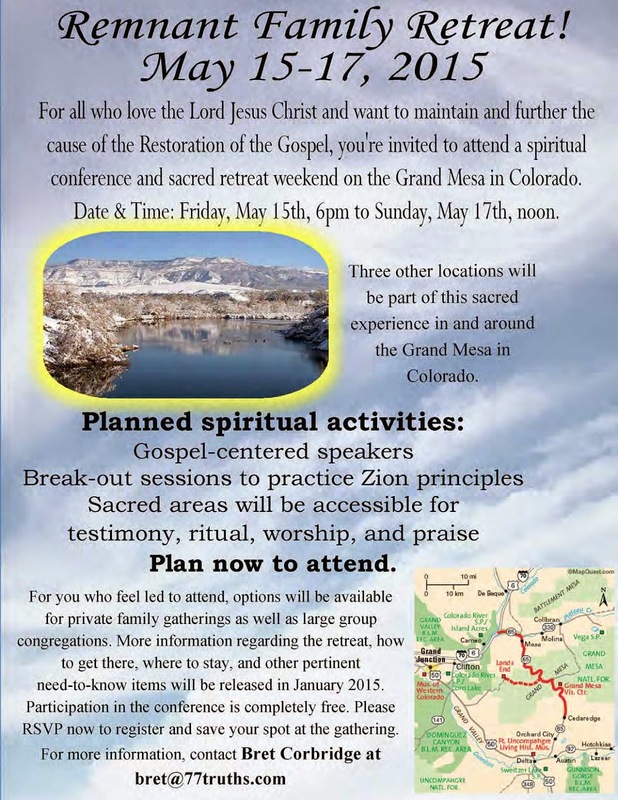 Bret Corbridge (author of 77 Truths) has selflessly been working very hard behind the scenes to plan a retreat/reunion for those who are seeking to commune with God and prepare themselves to one day be Zion. This will be a wonderful event, and I'm looking forward to attending and participating. I've never been to the Grand Mesa in Colorado, though I've heard great things about it, both as it is now, and as it will one day be. But even better than the location will be the opportunity to rub shoulders with so many of you as we learn, worship, and praise together this May. Yes!!!! Can't wait. We will see you there! My wife and I will be pleased to attend. Yes! Thanks Adrian! I'll see you there. Can you please let us know what the Breakout sessions include and who is teaching these? Is a remnant really a remnant who self describe as a remnant? This morning I read 4Nephi verse 3 where it talks about them having no poor among them. It reminded me of Moses 7:18 that you used in your blog. Such an interesting mark of Zion. Interesting too, how I don't feel this is a focus of establishing Zion as we're taught in the church. I will be there, God willing! I will be allowed to be part of this through His grace, and His authorization alone. No one starts or completes Zion without His commission. This is His show. His party. His work and His glory. I'm so grateful it's a come-as-you-are party! It is truly the Wedding Feast. The midnight hour has come and the call has gone out. Who will receive the Bridegroom and enter in? Who will come to the feast? But accepting the invitation requires the humility borne of knowing that Zion is an opportunity that has not been possible, and an invitation that has not been extended, for generations. And it will indeed take more sacrifice, patience, longsuffering and love unfeigned than any of us are currently capable of. Good thing this is His work, not ours! Good thing He provides the required cloak of charity we need to endure His everlasting burnings and enjoy sitting and supping with Him and the Fathers and their wives and families together in Zion. It seems so impossibly daunting! We are so foolish, proud and full of envy and anger. We. ARE.hypocrites. Every lousy day! We are indeed the scum of the earth. Yet, we know in Whom we have trusted (and in some cases, Whose we are). We have communed with the Powers of Heaven and they have wiped the sweat of telestial turmoil from our brow. We have been comforted, even by our Savior Himself, in His arms. Zion will be built by the humble followers of Jesus Christ under His direction, and we'll walk with Him there. I pray I will qualify and meet each of you there and rejoice together in praise and joy! What I do know is that some of the details are still being finalized, and that Bret Corbridge is doing a great job of planning everything. He will be publishing a schedule soon with more information. The point for now is just to keep your calendar open if you think you might be interested. And if you think you're going to attend, please email Bret at bret@77truths.com so he can get a headcount. I know one of the challenges he's facing is whether to plan this event for 50 or 500. So please RSVP, he'll work his magic, and we'll all know more soon. Thank you all for the questions and interest. I'm looking forward to seeing you there! It's interesting how willing many r to Chase a gathering. In the last days there will be many that say "Lo here" and "Lo there". Christ will gather His people when its time. Be careful following others who say they speak forChrist. I know there is many who are lonely that need fellowship. Fact is we all do...but be careful of rushing to the Mesa. It's a scared place and rushing up the mountain before its time would not bring doldrums the blessings of heaven. Now, I honestly don't see what that has to do with what Adrian is doing? Christ is pointing out that if someone tells you the kingdom of God is here or over there, don't believe them because we are all part of his kingdom and it is part of us. So I think you should take some time and really read and understand this verse before you misrepresent it so dreadfully. Not sure how you know Bret to make such asumptions. Just because you see Bret as someone who says he speaks for Christ does not make it true. Truth is he said God asked him to do this and that we need to feel led to come. He never said God wants us to do this and you have to come. I for one am excited to support a friend that i know loves God and all people. Who even loved those who were persecuting him. To me he has exhibited Christ like attributes in many regards. I am supportive of this reunion, because so many people need it. This does not mean that it is the gathering of Zion. Just a preview. Practice. Besides i have been up the grand mesa and the hunting, drinking, driving of vehicles and a lot of things belonging to babylon being up in and around these sacred places lets me know that there will need to be a cleansing before it can even become more than what it is now. If it ever is to be more. We have got to stop being afraid of gathering, we are to gather to become and practice Zion principles. We have a long way to go but it will be neat to see the things that happen. Please people stop being afraid or putting fear into others. If you feel led, come. If you dont feel led, don't. It is that simple. Please don't persecute those who try and need something like this. That is why many of us have a hard time with the church. From your name it would seem that you are from the area and you speak from experience. I respect that. Perhaps you have been a witness to many folks rushing "too soon" or you may have rushed "too soon" yourself. "...rushing up the mountain before its time would not bring doldrums the blessings of heaven. " Thank you for this crucial warning, as much is at stake here. Will you please next follow up your warning with teaching of what you feel is the truth of the matter? What does "Christ will gather His people when its time" look like? How do I know it? What do I look for? Are you referring to Him through mortal servants, or visible, audible Powers of Heaven, or will an increase in intelligence to our mind through the Holy Ghost suffice? Or are you meaning only those who have received the Second Comforter? I'm willing to accept that you quite possibly are completely literal in your declaration. So supposing Christ does gather only those folks, in the gathering does He lead us personally, or does He invite us to use our agency to figure it out on our own (ie make mistakes until we get it right)? Does the warning you're giving us apply to any Conference or simply a Conference labeled with the express intentions of someday creating Zion, or only those immediately wanting Zion NOW? Do you feel we are to practice remotely via Internet and not gather until everyone is "ready", and "not rushing", and if so, how shall we know it? Or can interim practice gatherings be led by the angels until we are "ready and not rushing"? Please teach us how to NOT rush. I don't ask in a snarky manner at all. I take your warning of what NOT to do very seriously. I am now looking for you to share further light and knowledge about what TO do. Joseph of Grand Mesa. Thank you. I love the Lord, and I love all these dear friends and souls who are seeking for the Lord. Angelina, I understand your excitement at this gathering, as there are many lonely people out there that do not enjoy the fellowship of other “believers” weekly. I have been to the Mesa and live in its Shadow, and I do know its a sacred place. The Spirit is strong in many places, and there are places that are closer to Heaven than can be described. I know that any high place that is consecrated to the Lord can and does become a Temple to Him. The Mesa could be the place where Zion is built, but it can change according to what happens with situations like this. As the one Anonymous person said in Luke, the kingdom of God is within, and going to a place or a conference seeking Him doesn’t necessarily make that happen as its already a part of us. I do not have any qualifications in the worldly sense, save I have gone to a certain point in this journey, and I have experienced the Lords Voice and I know my standing before Him, and I do not use the word know lightly. He does live, and He is so very willing to communicate through the Veil His love for us, and his guidance. I have not experienced the 2nd Comforter yet, as I still look forward to that. Waiting on the Lord....not easy for sure. You asked for guidance on these matters, I say ask the Lord to instruct you directly, and if not directly that He will give you knowledge or intelligence, and or send “true Messengers”. I have experienced this pattern. I wanted to know further regrading calling election, and it become very painful as I felt more and more the need to know. Well, I meet some friends I known for some time at the ZION Grand Junction talk by Denver. He asked me a question that struck me, later I contacted them and we had further conversations. This eventually led to some vary sacred experiences, and the friendship and the knowledge gained has been invaluable. The Point is trust the Lord to instruct you. I could tell you much, but I feel constrained to allow you the privilege of finding the Way through Christ. I will say this...Zion first is formed and created (important word) in the Heart. I feel that it is starting to come to together, but it will be first and for most a people that have Charity within them, that are like Christ in that they have sacrificed for his Gospel in whatever way they are called too by Him. I am much like the Sons of Mosiah and Alma, in that they have sinned nigh unto death, and would that no man suffer that same fate. Angelina and all, we will meet one day, that is clear, just keep your eye on the Savior and none else. It saddens me how many people tell me that the people will only be gathered when it is time, or that we will live all the commandments of God again when it is time... It is a lousy and wicked generation that seeks to excuse themselves from seeking the Lord on the flimsy basis that the president of the church has not yet commanded in all things sufficiently for them to feel obligated. What slothful and foolish servants! they will be very disappointed when their master returns to find that they had done nothing to increase their talents. He will not be happy with us for this slothfulness. The time to gather, build Zion, and obey the word of the Lord in the scriptures is always NOW! David did not mention any names, nor did I get that feeling from reading the blog post. Stop assuming. You did not get a FEELING. I will be there if I can. I will be there, God willing. If I do or don't go, I think it will be okay as long as I am humbly and sincerely striving to do my Lord's will. Fearmongering to go or not to go ought to mean nothing. If it is wrong, the devil will want us to go. If it is right, the devil will want us to stay away. How do you register to attend?? You can download the PDF there with complete instructions. Essentially, you contact Bret Corbridge and let him know you are coming.